What is VLOOKUP Formula & how to use it? I often tell my excel school students that learning VLOOKUP formulas will change your basic approach towards data. You will suddenly feel that you have discovered a superman cape in your attic. It is that awesome. 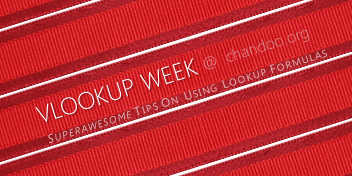 We have talked a lot about VLOOKUP and other lookup formulas recently during VLOOKUP Week. 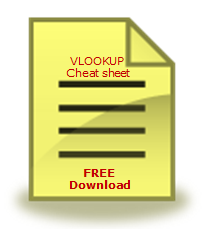 In this post I am giving away a free VLOOKUP formula cheat-sheet for our readers. This cheat-sheet is prepared by Cheater John specifically for our readers. 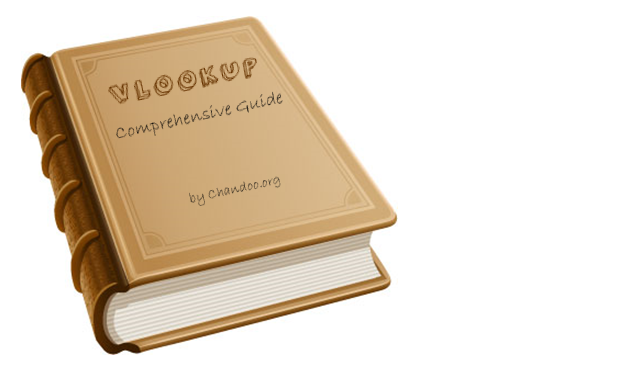 I hope you enjoy the one page help on VLOOKUP. 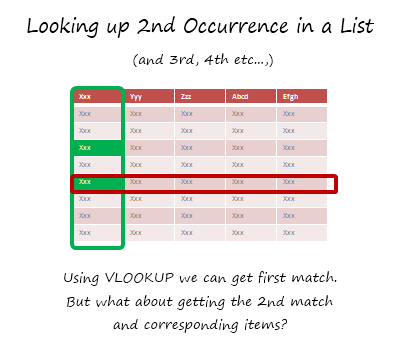 We know that VLOOKUP formula is useful to fetch the first matching item from a list. So what would you do if you need 2nd (or 3rd etc.) matching item from a list? For eg. If you have below data, and you want to find out how much sales John made 2nd time, then VLOOKUP formula becomes quite useless. Or is it?!? Read more to find how to solve this. How to write 2 Way Lookup Formulas in Excel? So far we have seen what VLOOKUP formula is and how to put it to some nifty uses. Today, we will go one step further and learn how to do 2 Way Lookups. 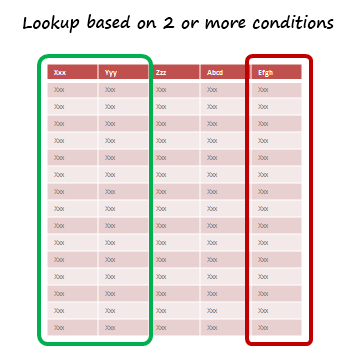 What is a 2 Way Lookup? Lookup is when you find a value in one column and get the corresponding element from other columns. 2 Way Lookup is when you lookup value at the interesection corresponding to a given row & column values. For example, assuming you have data like below, and you want to findout how much sales Joseph made in month of March, you are essentially doing a 2 way lookup. Excel Tables, a newly introduced feature in Excel 2007 is a very powerful way to manage & work with tabular data. I really like tables feature and use it quite often. If you are new to tables, read up Introduction to Excel Tables. 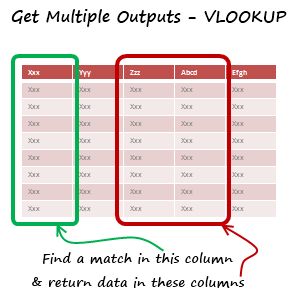 In this short video tutorial I explain how to combine VLOOKUP, INDEX, MATCH formulas with Excel Tables. SituationVLOOKUP is great for extracting information from a huge data table based on what you are looking for. But what if you need to extract more than one column of information? For eg. Lets say you have salesperson’s name in left most column, and monthly sales figures in next columns, one for each month. Now, you want to find the total sales made by a given sales person. How do you go about it? Read more to find how to solve this. VLOOKUP (and other lookup formulas) are very powerful and quite practical. They can fetch you the information you are looking for from a heap of data. Now that we have seen the power of VLOOKUP thru several posts this week, I want to test your understanding of these formulas by presenting 3 challenges. The challenges are, (1) Calculating amount payable after applying quantity discounts, (2) Calculating amount payable after applying accumulated quantity discounts, (3) Calculating unit price after finding the closest match. How to Lookup Values to Left? There is no argument that VLOOKUP is a beautiful & useful formula. But it suffers from one nagging limitation. It cannot go left. Let me explain, Imagine you have data like below. Now, if you want to find-out who is the sales person who made $2,133 in sales, there is no way VLOOKUP can come to rescue. This is because, once you search a list using VLOOKUP, you can only return corresponding items from the column at right, not at left. Sometimes we don’t know what we want. If this happens when I am in a bar, I usually order a cocktail. Just a mix of everything. The same will work in Excel too. Often we need our lookup formulas to go wild. Not in the sense of go-wild-and-chomp-a-few-kilo-bytes-of-data sense. But wild like wild cards. For eg. In the below data, we may not remember the full name of sales person, but we know that her name starts with jac. Now how do you get the sales amount for that person? 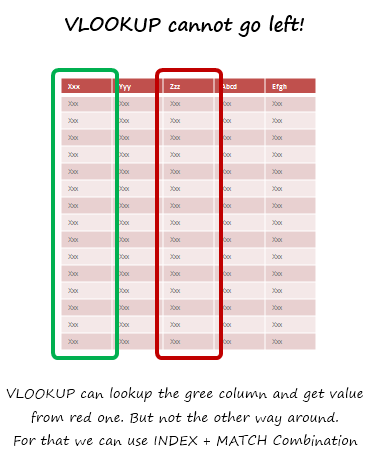 VLOOKUP is one of the formulas you can use in this situation. VLOOKUP searches a list for a value in left most column and returns corresponding value from adjacent columns.